Thank You Tee Gift Donors! Thank You Raffle Prize Donors! The need for tuition assistance at St. Francis of Assisi Catholic School is ever present. During the 2016/2017 school year, 37 students, representing 25 families, received $118,103 in total financial assistance. Awards were given from either our Tuition Assistance Fund or our Hopes and Dreams Fund. We anticipate awarding a comparable amount of assistance in the 2017/2018 school year. Due to the limited resources in our Tuition Assistance Fund, we are unable to offer full assistance to any family. 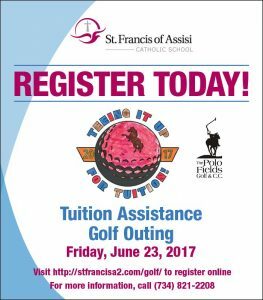 Proceeds from the St. Francis of Assisi Catholic School Teeing It Up for Tuition Golf Outing will help us continue to provide families who have a financial need the Catholic education they seek at our school.